A South Australian solar energy company is in talks with 'major developers' to build energy self-reliant housing estates which don't need to be connected to the main electricity grid. Zen Energy Systems, which specialises in solar, says its new battery technology has attracted the attention of major developers who see an opportunity to avoid expensive connection to the mainstream electricity network. The idea of communities and individuals going “off grid” is on the agenda of the nation’s energy ministers, with consultation on a discussion paper on the issue due to close next week. Advocates argue that taking smaller communities off the main transmission network could reduce costs for all users, by reducing inefficiency in the system. Zen chief executive Richard Turner told a joint Planning Institute/Engineers Australia seminar recently that new technology meant “micro grids” were a real option for small towns and new housing developments. Turner said he was studying the feasibility of removing SA towns from the electricity network using a combination of roof-top solar, wind energy and other options such as co-generation (where heat from an existing industrial process is used to generate power). The pay-off for the local community would be that they would once again control their energy future, while the broader community should gain cheaper energy by reducing transmission costs across the entire network. “If we transferred those towns to micro-grids that relied on local generation and local storage of renewable energy, and took them off the main transmission grid eventually, with community-owned models … then we would have a much more efficient system,” he said. “That would then make our city networks much more efficient and translate to a lower cost of power for everyone. Turner is preparing to offer a battery to the domestic market which can store excess energy produced by solar systems for use in the evening. A product for off-grid use in regional and remote areas is already on the market. 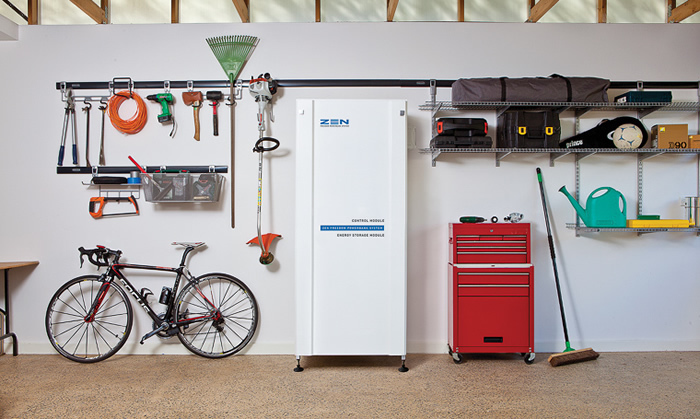 The 10kwh “Urban Powerbank” – the size of a domestic fridge – is likely to be on the market mid-year. He says development of this technology, which has been supported by a $200,000 State Government grant, has attracted the attention of housing developers who see an opportunity to free their projects from the expense of connecting to the mainstream electricity grid. “Interestingly enough we are having many housing developers coming to us for new housing estates saying – ‘look can you take me through all the options … right through to taking the whole development off the grid’. The model Turner is discussing involves each home being fitted with solar panels and battery storage, supplemented by micro-gas generators, either small units connected to each home or larger units serving several streets and maintained by the developer. The Zen Energy “Powerbank” uses high density lithium ion batteries to capture renewable energy. State Energy Minister Tom Koutsantonis told InDaily that localised generation was a good option for the future of regional towns and for individuals to save costs. “With one in four household customers in SA now using solar PV systems and as energy storage devices such as batteries reduce in cost, there is enormous potential for customers to offset their electricity usage and, in future, be serviced by more localised generation and energy storage,” he said. He said Energy Ministers had released a consultation paper to consider whether the current regulatory framework was appropriate for these new emerging products. Submissions on the paper close at the end of next week. The executive director of the Urban Development Institute in SA, Terry Walsh, said he was not aware of greenfields developers seeking to go “off grid” but he believed it was fast becoming a feasible option. “The notion of mini-grids is a really good one,” he said. Walsh said there was a new trend in urban areas for groups of people approaching retirement age to build community housing – essentially an informal independent living arrangement where you’re surrounded by like-minded people. He believed these sorts of endeavours would find the concept of a mini-grid most attractive. “For them this is an ideal opportunity,” he said.